Mosaic has announced its Mentors of the Year for London and the South East during its annual end of year event celebrating another hugely successful twelve months of work in the region. The winner for London was Khurshid Khan, Managing Director of UMEA, Encyclopaedia Britannica. Khurshid began mentoring at Little Ilford Secondary School in 2014 and he became the Lead Mentor on the Secondary School programme at the same school for the 2015/2016 academic year. This academic year he also mentored on the Enterprise Challenge as well as the Secondary School Programme at Little Ilford. 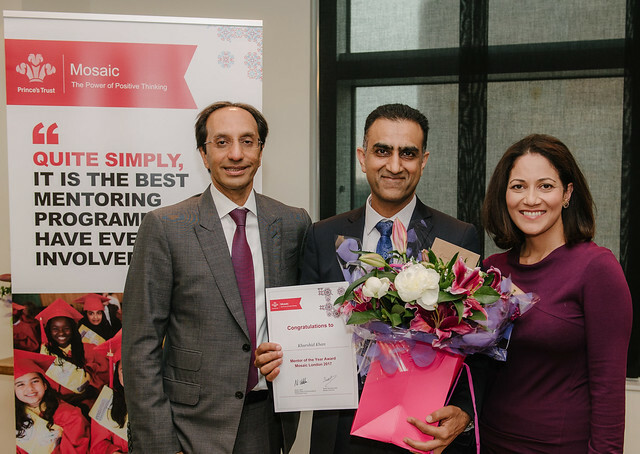 The South East winner was Jag Sidhu, Corporate Client Director at HSBC, who has been mentoring with Mosaic since 2015. He started out on the Mosaic Primary School Programme at Alban Wood Primary School making a huge impact to the children and parents on the programme. While continuing as a Primary School mentor, Jag also decided he would mentor on the Enterprise Challenge at Eden Girls Slough this year. “I am very happy and surprised to have been named Mosaic South East Mentor of the Year 2017! It is a huge honour and I would like to thank the Mosaic team for their support and above all the support from the Teachers and Children who have worked and contributed and ultimately benefited,” said Jag. A special award was also presented to Dalia Abubakr of Skinner’s Academy in Hackney, who was named “Link Teacher of the Year”. Dalia has coordinated the Mosaic’s work in her school for several years now, including the two times that teams from Skinner’s Academy have won the Grand Final of the Enterprise Challenge. The special celebration event was held at the offices of Hogan Lovells International LLP in London and featured a keynote speech from Mishal Hussain, a presenter on BBC Radio 4’s flagship Today programme as well as being a longstanding Mosaic Ambassador. Attending the event were mentors and mentees from across Mosaic’s programmes who had the chance to meet with many from Mosaic’s leadership team and several of its benefactors. Mosaic runs all of its programmes across London and the South East, namely its Primary School and Secondary School programmes as well as the Enterprise Challenge competition. To see more photos from this event, either click the image above or click here.